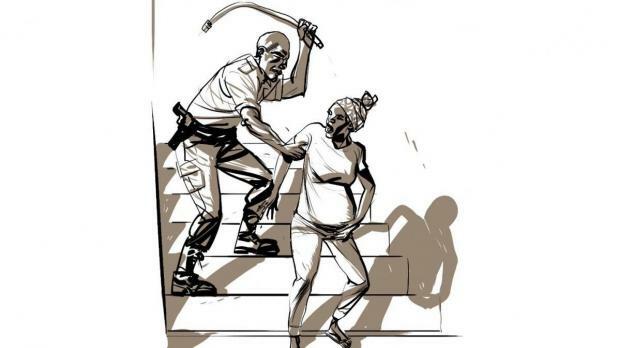 A seven-month pregnant Nigerian woman said she was beaten by a guard. European Union policies contribute to a cycle of extreme abuse against migrants in Libya, Human Rights Watch said in a report on Monday. The 70-page report, “‘No Escape from Hell’: EU Policies Contribute to Abuse of Migrants in Libya,” documents severe overcrowding, unsanitary conditions, malnutrition, and lack of adequate health care. Human Rights Watch said it found violent abuse by guards in four official detention centres in western Libya, including beatings and whippings. It witnessed large numbers of children, including newborns, detained in grossly unsuitable conditions in three out of the four detention centres. Enabling the Libyan Coast Guard to intercept people in international waters and return them to cruel, inhuman, or degrading treatment in Libya can constitute aiding or assisting in the commission of serious human rights violations, the organisation said. In its recommendations, it said Libyan authorities should end arbitrary immigration detention and institute alternatives to detention, allow UNHCR to operate in full respect of its mandate, improve conditions in detention centers, and ensure accountability for those who violate the rights of migrants and asylum seekers. EU institutions and member states should ensure and enable robust search-and-rescue operations in the central Mediterranean, significantly increase resettlement of asylum seekers and vulnerable migrants out of Libya, and impose clear benchmarks for improvements in Libyan search-and-rescue capacity as well as treatment and conditions in detention centers in Libya, and be prepared to suspend cooperation if benchmarks are not met. It said United Nations agencies should press for respect by EU and Libyan authorities of the rights of migrants and asylum seekers in Libya and should increase coordination amongst themselves and with Libyan authorities to ensure that people with protection needs, including children, are properly identified, tracked, and protected.